Christmas season is fast approaching and I am dreading the shipping portion of the holiday. While many women love to go to the store and shop, I am missing that gene. Don't get me wrong I like going and buying shoes and the occasional birthday gift, but there is something about Christmas shopping that makes me feel like a deer caught in the headlights. The crowds are always large, patience is at a minimum, and parking lots turn into madhouses. The whole situation just stresses me out. I end up drinking too much coffee to cope, making me even more agitated and cranky. I wish the holidays would have less importance placed on gifts and a little more focus on just enjoying the company of loved ones. My family absolutely loves meatloaf. They would eat it multiple times a week if I let them. Since I can't eat gluten I am always looking for recipes that I can modify to fit my needs. 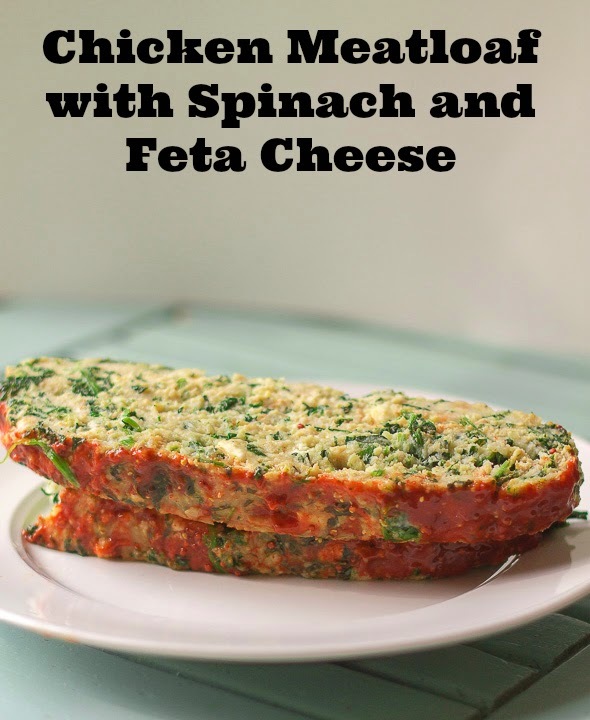 The following is a recipe for Chicken Meatloaf with Spinach and Feta Cheese that works with both regular and gluten free panko breadcrumbs. Recipe adapted from Redbook Magazine and Heather Cristo. Combine together panko breadcrumbs and whole milk in a small bowl. Let stand until milk has been completely absorbed into breadcrumbs. In another bowl combine chicken, onion, parsley, dried oregano, spinach, cheese, eggs, Greek seasoning and ground pepper. Form meatloaf into a football shape and place on a parchment lined baking sheet. In a small bowl combine 1/4 cup ketchup, 2 tablespoons grainy mustard, 1/4 teaspoon cayenne, 1/4 teaspoon cinnamon, 1 teaspoon smoked paprika, 2 tablespoons brown sugar, and 1 teaspoon red wine vinegar. Brush the top of the meatloaf with the glaze. Bake for 25 minutes in a preheated 375 degree oven. This recipe works very well with gluten free panko breadcrumbs. If you eat gluten free and have never tried gluten free panko breadcrumbs, they are great in meatloaf and meat dishes. If you don't have Greek seasoning you can just add salt or another variety of seasoning salt. Make sure to completely squeeze your spinach dry. 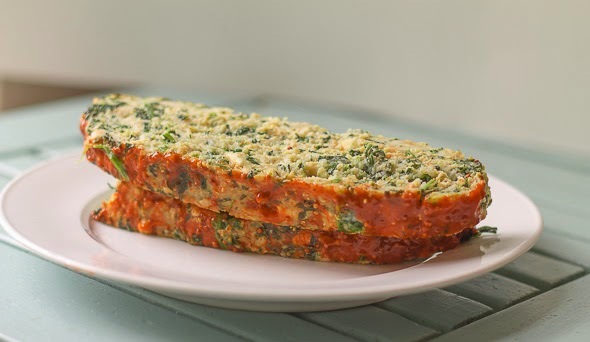 If the spinach stays too wet the meatloaf will be soggy after baking. I love this recipe! I think I never make s chicken meatloaf. I love Christmas times but not the shopping part and dont like the crowds. Im agree. I love the part of baking and celebrated of course. Still i dont make any for halloween so I try to dont think in christmas. Chicken meatloaf is nice since it's lower in fat than beef, but still yummy :) I'm not a fan of the crowds either, people get way too pushy!! Ann, this is a lipsmacking meatloaf recipe. I love the add of spinach. Good job, Ann. I'm a big fan of spinach in recipes. It gives nice flavor and adds vitamins! I'd like it to be less secular too. I have to admit though, even when saying that, that I'm the worst one in the family for going overboard on the shopping that time of year. My mom always went overboard at Christmas too :) I still buy lots of gifts, I just wish that the gifts didn't get to be such a big production! Yum - right after I post a vegan dining experience on my blog you put this up and make me want chicken. And meatloaf! I love a lot of vegan food :) Seattle had some great vegan restaurants when I lived there and I ate at them a bunch! Plus vegan brownies are really good, I make them for my kids all the time.